I had a guardian angel watching over me. When I felt little things, like a rush of air running away from me, as a result of ARDS (Acute/Adult Respiratory Distress Syndrome), all I needed was a soulful look from the depth of Blues’ brown eyes, a simple twitch of his nose, and a subtle tilt of his head, to let me know, that everything was going to be okay. On June 11th, 1993, I was admitted to a community hospital, for what had been described to me as routine surgery. Unfortunately, the word “routine” quickly lost its literal meaning, as I developed a number of complications. My weekend in the hospital, turned into nearly two months, and my life as a secondary school vice principal, was tucked away in my “memory file.” It was a brand new world, a world that I had to learn to participate in, one step at a time. There was daily physiotherapy and neuropsychological assessments, followed by “skills for daily living” sessions. I had once headed a high school special education department and run workshops across the province, and now here I was, trying to learn the very same things that I had taught my students. I remember the day I had to relinquish my driver’s license. I still keep my photo card in my wallet. I remember when my walker was no longer a rental, but was all mine, an aide I never dreamed I would ever need, but provided me with the opportunity to walk unaided, when on weekly visits to the Hamilton Market, to a mall, or even to a dog show, and now, all these many years later, enables me to participate in obedience and field activities with my dogs. I remember the day I got my four-wheel scooter. It provided me with a feeling of independence that at times, I thought I had lost forever, but the best was yet to come. 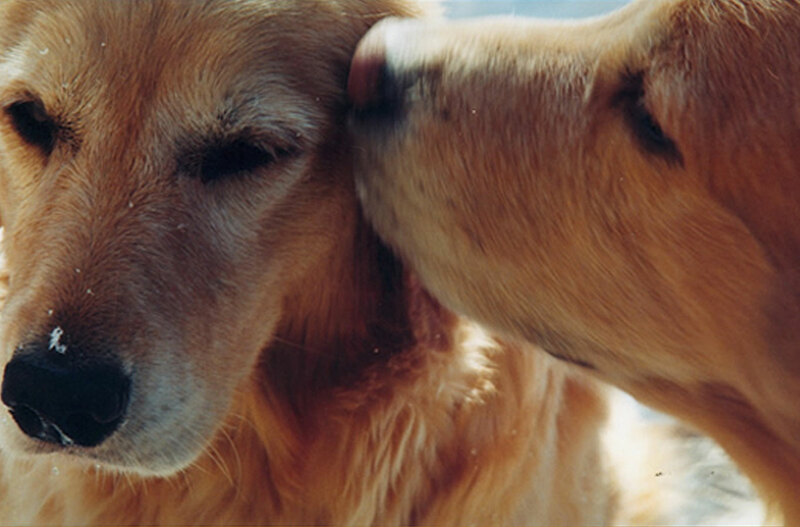 On April 21, 1995, we brought a golden bundle of fluff into our home and hearts. We are all familiar with the saying, as one door closes, another opens. Blues allowed me to step over the first threshold, and, after that day, we opened many doors together. Blues became a Canadian Champion, a Canine Good Citizen (certified by the Human/Animal Bond Association of Canada, and he also passed all of the requirements to become a St. John Ambulance Therapy Dog. I have no doubt in my mind, that Blues was a healer. On so many occasions, I saw him weave his magic with people young and old, sick and well. He even became a “Rent A Dog”, accompanying a wonderful neighbour on regular walks along the waterfront trail. Blues and I also enjoyed making informal outdoor visits to a nearby seniors residence. Blues became a fixture in Bronte, often being referred to as Bronte Blues. He had a tail wag and a smile for everyone. He was a truly remarkable dog. Each of us has been touched by cancer in one way or another. We can try to run and hide, but inevitably, its evil grin will cross the threshold of our homes. It crossed ours in the summer of 2000, and our lives were changed forever. On March 27th, 2001, our beautiful Blues lost his battle with lymphoma. He was the sun and moon and stars to us. He was our Smiling Blue Skies. He was everyone’s Blues Man. In Blues’ memory, a special cancer fund was set up through the University of Guelph’s Ontario Veterinary College Pet Trust Fund called “Pet Trust: In Memory of Blues,” and today we are proud to say, that because of the support of so many, The Smiling Blue Skies ® Cancer Fund/The Smiling Blue Skies ® Fund for Innovative Research, has raised nearly 2 million dollars, helping to change the face of cancer, on behalf of the precious pets and people in our lives. I lost the heart of my heart, my Blues Man, to lymphoma, on March 27th, 2001. At the time, it seemed to me, that Blues had been stolen from me, taken off to become one of the brightest new stars in the sky, but I also knew that in the deepest part of my being, Blues gave himself to the stars, so that he could give life back to another, here on earth. My father’s birthday is March 27th. Birthdays are a time for celebration, for joy and laughter. On March 27th, 2001, I cried until there were no more tears to be shed, and then I cried again. It has been said, that our animals shepherd us through certain times in our lives, and when we are ready to turn the corner, and make it on our own, they let us go, but I wasn’t ready to let go. And then I understood . 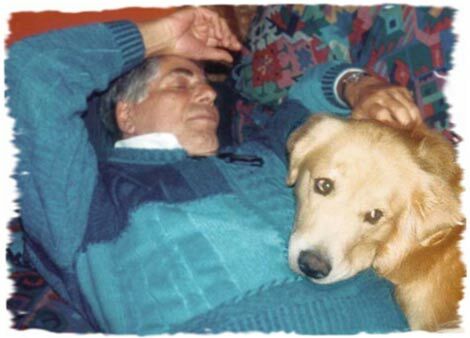 . . One week before Blues died, my father was given a clean bill of health by his doctor. It wasn’t just any check-up. My father had survived two rounds of bladder cancer, a cancer that my family did not talk about openly, but, all the same, it clouded our thoughts, every single day. It would have been easier, if we could have shared our frustrations, and our sense of helplessness, in our inability to cure my father, but talking about it, was simply something we just didn’t do. But Blues knew. He loved my father fiercely, and there was a magical quality to the special relationship they shared. One afternoon, not long after my father had undergone surgery, he and my mother came to our home for a visit. When my father came through the door, he looked as though he had aged several years, and though I never said it, I really feared that we were losing him. He ate very little, and then he went to lie down on the futon in our living room. We surrounded him with pillows, and covered him with a blanket. A few minutes passed, and then Blues, ever so gently, jumped up on the futon, and lay beside my father. He didn’t nuzzle my father as he usually did, but lay perfectly still by his side, ever watchful. Soon, my father began to stroke Blues’ fur. Blues had been my very special guardian angel and now he was my father’s, because, when my father got up from the futon some time later, he stood straight, no longer stooped over, and the grey pallor had left his face, to be replaced by a healthy flush. He said he felt better than he had in a long time. The change was like being part of a magic show, and not being able to figure out the sleight of hand. My parents left, and Blues slept nearly a day away. We talked about what had happened, but never really entertained the thought, that on that day, whose date I don’t remember, Blues had performed a miracle of love and healing. 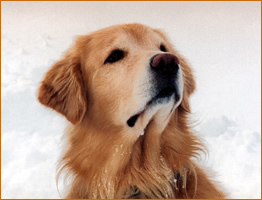 In the summer of 2000, Blues was diagnosed with lymphoma, and on March 27th, 2001, he lost his courageous battle. He was the sun and moon and stars to us. He was our Smiling Blue Skies. He was everyone’s Blues Man. Blues gave us a lifetime of love and memories, in his six short years with us, and I believe, deep in my depths, in a special place we call the soul, that Blues traded his lifetime, so that my father could have his. Blues surely was our show dog, and every day, even now, over 17 years later, he continues to show us how to live, love, laugh, and, most of all, to learn. Tonight, go outside, and turn towards the stars, and if you close your eyes, and listen really hard, you will hear the wonderful music of our Blues Man, the music of life, and of sweet dreams. You can’t have a rainbow, if you don’t have the rain. You can’t see the rainbow, if you don’t feel the rain. In my mind’s eye, and in my heart, there will always be Smiling Blue Skies.